* I am going to devote today’s Quick Takes to the fifth anniversary of the horrific shooting in Newton, Connecticut at the Sandy Hook School. We’ve had other mass shootings since that day, and all of the victims deserve our undying commitment to doing something to stop them from ever happening again. * Here is the image that captured my feelings so well. * President Obama has said that December 14, 2012 was the worst day of his presidency. His press secretary at the time agrees. 5 years ago today was my worst day at the White House. I saw my normally stoic boss break down. I lost my composure at the briefing. 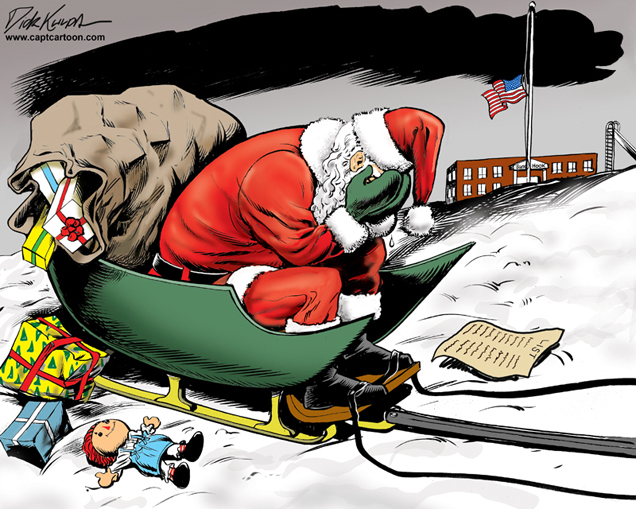 As a parent, I could not comprehend the horror of #SandyHook. I think of those innocent children, and their brave teachers, all the time. * We were blessed at the time to have a president who spoke to our grief by addressing his own. Five years ago today, 20 first-graders and six school staffers were murdered at Sandy Hook Elementary School in Newtown, Connecticut. * A few days later, Obama attended the memorial service in Newtown. Joshua DuBois told us about the solemn moments of comfort. The president took a deep breath and steeled himself, and went into the first classroom. And what happened next I’ll never forget. The staff did the preparation work, but the comfort and healing were all on President Obama. I remember worrying about the toll it was taking on him. And of course, even a president’s comfort was woefully inadequate for these families in the face of this particularly unspeakable loss. But it became some small measure of love, on a weekend when evil reigned. And the funny thing is—President Obama has never spoken about these meetings. Yes, he addressed the shooting in Newtown and gun violence in general in a subsequent speech, but he did not speak of those private gatherings. In fact, he was nearly silent on Air Force One as we rode back to Washington, and has said very little about his time with these families since. It must have been one of the defining moments of his presidency, quiet hours in solemn classrooms, extending as much healing as was in his power to extend. But he kept it to himself—never seeking to teach a lesson based on those mournful conversations, or opening them up to public view. * I’ve focused on Obama because his words and actions at the time spoke for me – and probably the rest of the country. I can’t bear remembering the pain of that particular shooting while dwelling in the toxicity of our politics today. I will forever be grateful that we had a president at the time who not only comforted those families with compassion, grace and dignity, but also helped the rest of us deal with our grief as well. * Finally, Cheryl Crow has released a song titled, “The Dreaming Kind,” with proceeds going to Sandy Hook Promise. The tragedy in Newtown 5 years ago and the countless lives lost in mass shootings since have weighed heavily on my heart. I felt compelled to write “The Dreaming Kind” for the incredible people at Sandy Hook Promise who work so hard every day to combat gun violence. The extraordinary work this organization does to educate and protect our nation from further bloodshed gives me hope for a better tomorrow. I hope this song will inspire the same feeling in those who hear it.